CATHY FINK & MARCY MARXER: Swing It, Baby, Swing! From the Rounder Records CD All Wound Up! LE VENT DU NORD: Au Bord De La Fontaine From the Borealis Records CD Maudite Moisson! 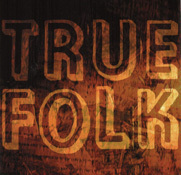 True Folk is a CD fundraising project benefiting the North American Folk Music and Dance Alliance, an organization which exists to foster and promote traditional, contemporary, and multicultural folk music and dance, and related performing arts in North America. The Folk Alliance seeks to strengthen and advance organizational and individual initiatives in folk music and dance through education, networking, advocacy, and professional field development. Folk Alliance is a non-profit 501(c)(3) membership organization of individuals, businesses, and societies, and information on joining can be found at www.folk.org. Chris Smither and Jorma Kaukonen recorded the Fulton Allen song “Step It Up and Go” especially for this CD. ALL PROCEEDS FROM THE SALE OF THIS CD WILL GO TO BENEFIT THE FOLK ALLIANCE.